Just a few months ago, these pretty little cookies popped on the screens everywhere I went. So dainty, colorful and tempting! Everyone was all ohs and ahs about how wonderful these treats are. I’m curious person by nature. And since I could not find anything like this where I live (I live in the middle nowhere! ), I googled the recipe for these beautiful treats. Found ton of recipes, read countless tips and tricks (apparently they are quite finicky! ), drooled over many, many gorgeous photos, and I finally made them! Oh, sweet little macarons, where have you been all my life? They were so absolutely delicious. To make up for all the lost time without these gems, I was on the roll making them day and night. Ok, maybe a little exaggeration, but you got the idea, I was obsessed! I can’t say I’ve perfected these delicate little cookies yet. But as you can see they’re not that bad. Now, that I had made these gems more than handful of times and I’m pretty confident with the technique, and I thought I would share my process. 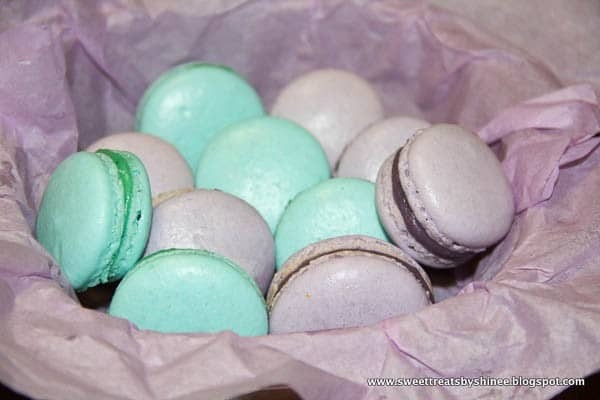 This is the simple macarons recipe though, no flavorings or anything. Down the road, I’ll be experimenting with more flavors!! But for now, this is perfect for us, beginners. Bring the egg whites to room temperature, they beat easier. Make sure your bowl for egg whites is super clean and free of any streaks of grease. Glass or stainless steel bowls are best, because plastic bowl tend to absorb oil. Even the tiniest trace of oil, or egg yolk will prevent the egg whites from whipping into fluffy meringue. 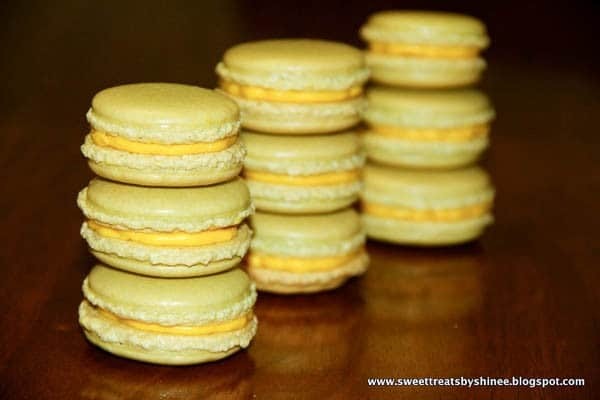 Use thick baking sheets to bake evenly and prevent browning from the bottom of the macarons. If you over-mix the batter, the macarons will spread too much, won’t form feet and/or they will be hollow. 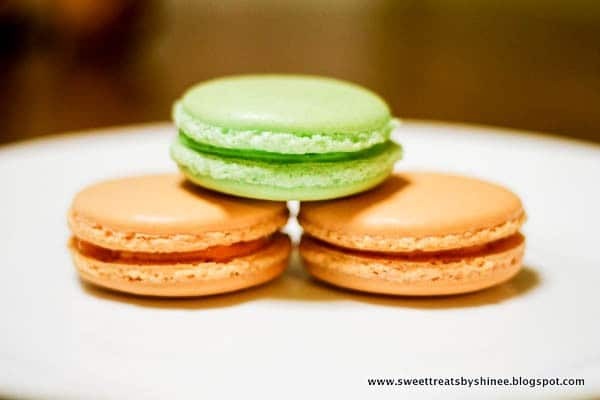 If you under-mix the batter, your macarons will end up with uneven surface and without feet. To prevent browning the macarons from the top, place an empty baking sheet on a top rack. This way the heat from roof of the oven is blocked, preventing the macarons brown too much. I’ve baked the macarons on both silicone mat, and parchment paper. 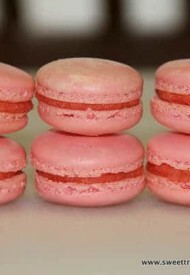 In my experience, macarons, baked on silicone mat, tend to have bulging feet, as shown above. Not the end of the world, but I prefer to bake my macarons on parchment paper for this very reason. Experimenting with fun colors and designs. 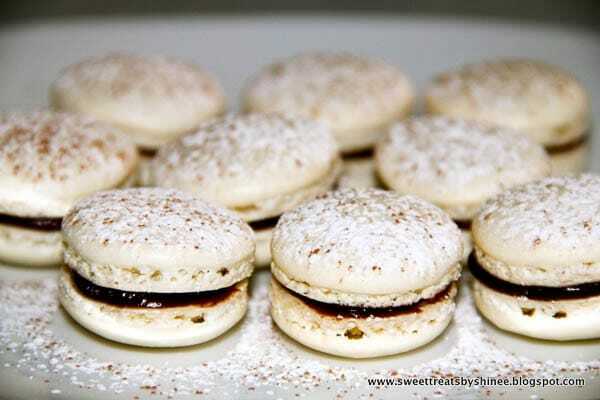 For more flavored macarons, check out my other macaron recipes. 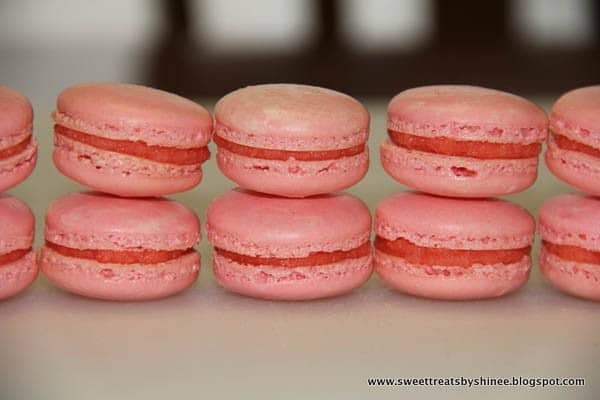 Basic French Macarons -perfect for beginners. Sift together almond flour and powdered sugar twice. Set aside. In a clean medium bowl, beat the egg whites on low speed until foamy. Add cream of tartar and increase the speed to medium. Slowly add sugar one tablespoon at a time. Continue to beat the egg whites on high speed until hard peaks form. Stir in gel or powder food coloring, if desired. Sift almond flour mixture over whipped egg whites, and gently fold it with a spatula until batter is just combined. 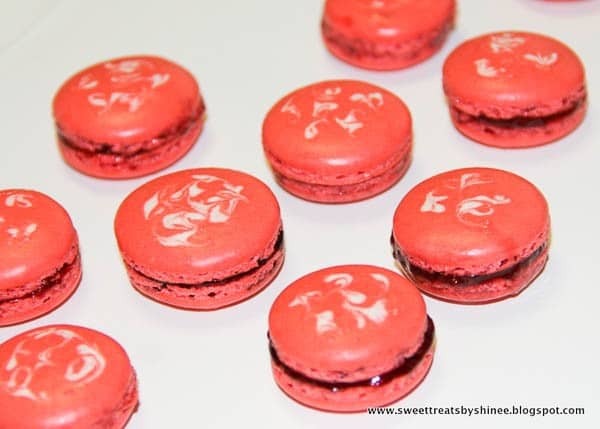 TIPS: Making french macarons is all about the technique. This is the most crucial step of all. Let me try to describe the folding motion as best as I can. Run the spatula clockwise from the bottom, up around the sides and cut the batter in half. I suggest to count every fold, I do about 50 folds, and then I start testing the batter on a small plate after every couple folds. To test, drop a small amount of batter on a plate. If the small peaks dissolve into the batter on its own in about 10 seconds, the batter is ready. If not, fold couple more times and test again. Be careful not to over-fold. Transfer the batter into a pastry bag with a round tip. Pipe about 1.5-inch rounds about an inch apart on prepared baking sheets. Tap the baking sheets firmly on the counter a few times to get rid of any air bubbles. Let the macarons sit out on the counter for at least 15-30 minutes, maybe up to couple hours, depending on humidity. When you lightly touch the macarons, and the batter does not stick to your finger, then it’s ready to go into the oven. While waiting, preheat the oven to 300°F (150°C). Bake the macarons one sheet at a time for about 18-20 minutes. It’ll take longer for larger macarons. The macarons are ready when they come off the sheet easily. 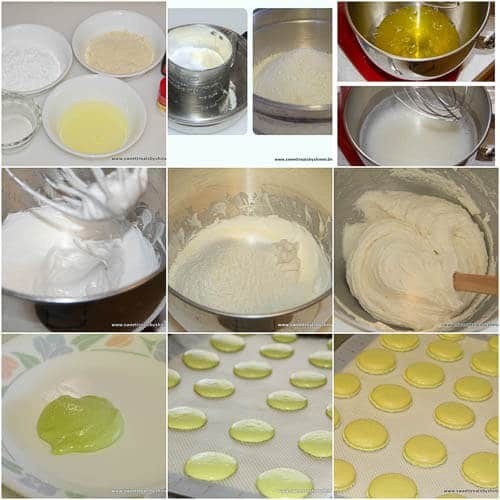 Cool the macarons on the sheet for 10-15 minutes, and then transfer the macarons to a wire rack to cool completely. To make the buttercream filling, in a medium bowl, beat the egg yolks slightly with a whisk and add sugar . Continue to whisk until the mixture is pale and sugar is mostly dissolved. Stir in the milk. Transfer the egg yolk mixture into a small saucepan and heat over low heat, stirring frequently. Continue to cook until it’s thick like pudding, about 5 minutes. Transfer the mixture back to the bowl and bring it to room temperature. Stir in the butter in three batches. Add vanilla extract and continue to mix until smooth. To assemble, transfer the buttercream filling into a pastry bag and fill the macarons. You can find step-by-step photo recipe for buttercream filling here.